Please join us for the Mosaic app building webinar on Thursday, November 30, 2017 at 10am PST. Mosaic enables users to access and share data, tools, pipelines, and analyses with collaborators or the entire community. Collaborations accelerated by the platform will speed the translation from data to insights, ultimately driving publications, partnerships and new ventures. Accelerate the improvement of methods and promote the adoption of best practices in microbiome research by enabling the benchmarking and improvement of tools and pipelines through the administration of community challenges. If you already have a DNAnexus account, simply sign in with your credentials. If not, you can get a free Mosaic account now by registering here. 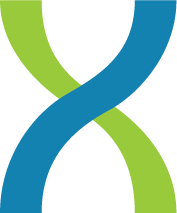 Mosaic features make bioinformatic tools accessible to the general microbiome research community, not just expert bioinformaticians. Developers can implement their own or open-source tools as Mosaic Apps using a web interface, and also make them public for the community to use and provide feedback. 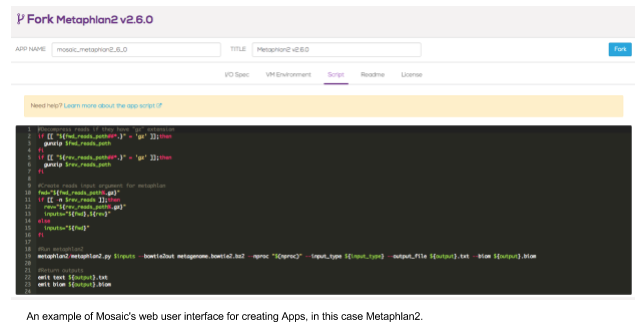 This enables other users to either run the App to analyze their data, or copy and improve the open-source Apps. Additionally, Mosaic makes collaboration easy by providing the ability to manage and share Workspaces with Groups of users, publish tools and participate in discussions. One of the core features of Mosaic is the ability to implement bioinformatic tools as Mosaic Apps, which users can run on the platform or share with the community. Join our webinar: Building Apps on Mosaic, Thursday, November 30, 2017 at 10am PST to learn more and start building your own apps on Mosaic. 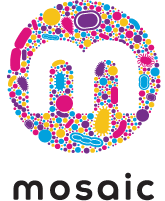 We’re excited about Mosaic’s Community Challenges, which will bring the microbiome community together in order to advance solutions that can be directly integrated into pipelines for translational microbiome science. The first community challenge, Strains #1 launches December 1, 2017. This challenge aims to improve the performance of computational tools in analyzing microbiome shotgun sequencing data, providing better quality profiling of microbiome samples at high resolution.